Have I told you how much I appreciate each and every one of you lately? No? Well, I do. I really, really do. Things have been overwhelming in my personal life and I really do want to show you how much you are appreciated. 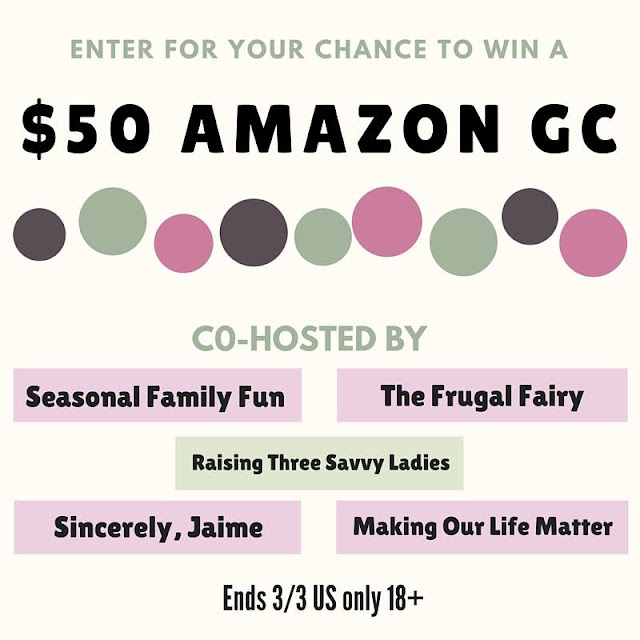 Because I DO appreciate you so much, I have teamed up with some phenomenally talented bloggers to give away one $50 Amazon Gift Card to a lucky reader. I mean... who doesn't love Amazon, right? I enter giveaways, contests, etc. to win Amazon gift cards and save them in my Amazon account for birthdays and Christmas. The prices are right, Amazon Prime rules and nearly EVERYTHING is on Amazon anyways. There are SO many easy ways to enter to increase your chances to win. Best part? You get to meet some AWESOME bloggers. Go ahead... give it a shot! My fingers are seriously crossed for you!! 18+ USA only. Winner will be notified by email and you have 24 hours to reply or a new winner will be chosen.